Receive your purchase at Naha airport. How convenient! 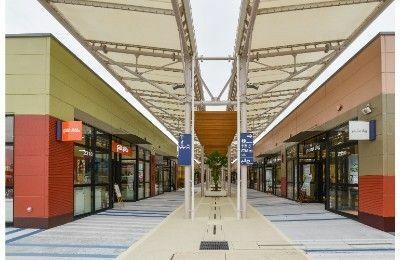 T Galleria Okinawa has a more than 10,000 square meter shopping area and offers over 130 brands of goods. 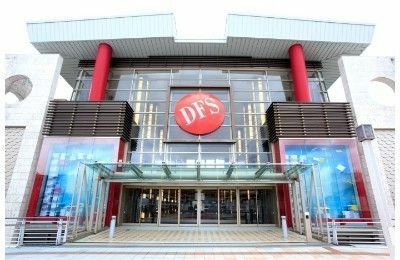 It is well worth visiting for shopping freaks, because some of the items are available at the 30% cheaper than the retailed price in Japan. Also, the reliable shopping advisor “Personal Shopper” is ready to help you if you need some advice. You can ask him or her about products, location, prices and pretty much everything about T Galleria Okinawa. Stop by on the final day of trip as nearby the airport! An outlet mall, located in Toyosaki area nearby Naha Airport, has more than 60 outlet stores. 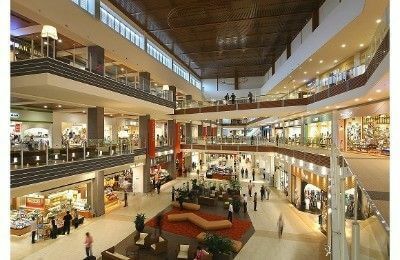 Since it includes not only luxury brands products but also well-known casual items, shoes, accessories, sporting goods, baby clothes and more, you and your family can enjoy shopping there. Also many restaurants and a food court are available. 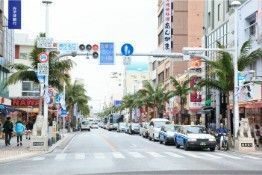 As the direct public bus runs from/to Naha airport, you can easily visit here just before departure or use your spare time when transferring to some remote islands. The 1.6 kilometer long shopping street, from the Prefecture Office North Exit Intersection and the Asato Three-forked Road Intersection, is also known as “Miracle Mile”, because the wartime devastated land was recovered rapidly and distinctly. There are many souvenir shops and restaurants along the street, which you can enjoy from the morning to the night. 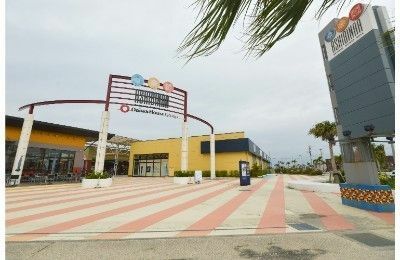 Almost of the major local souvenirs such as seasonings and cookies using local ingredients, Okinawan cartoon like character goods, the traditional crafts and so on, are available here. Please note that the special bus lane is enforced from 7:00 to 9:00 (toward the Prefecture Office) and from 17:30 to 19:30 (toward Asato) on weekdays. 4. HEIWA STREET IS BY KOKUSAI STREET!! This is the arcade placed between Kokusai Street and Tsuboya Yachimun Street. 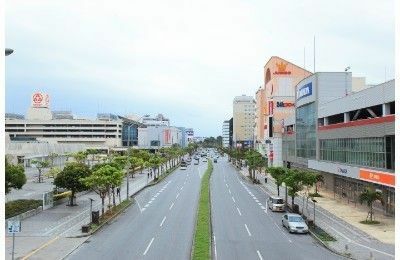 The entrance of Kokusai Street side is in front of Okinawa Mitsukoshi. There are the young targeted souvenir shops, T-shirt shops, folk craft shops along the street. Also, Okinawan style food courts and old fashioned clothes shops still remain in business here. 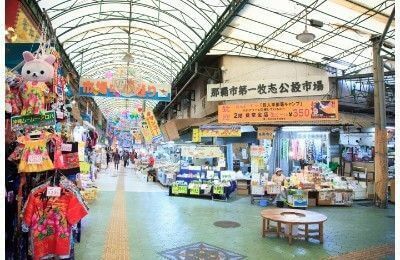 As the arcade is connected to Yachimun Street and Sakurazaka, and you can pass to Makishi Public Market from the midst of the street, it is always crowded and ebullient. This is Naha’s representative market. 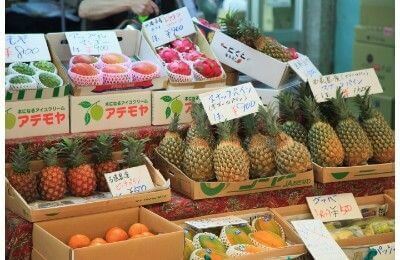 The market is filled by an Asian markets atmosphere created by many energetic Anmar (Okinawa’s mother) working here. It is divided into fresh fish, meat and vegetable sections, and around 130 stores are in business here. Some business has a more than 60 year history and tells you the history of the market while shopping. Some stores offer a domestic shipping of purchased goods. So, find souvenirs here. Shintoshin area is covered from Omoromachi station of Yui Rail to route 58. 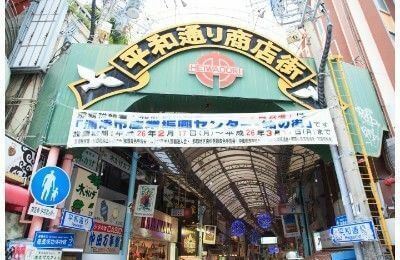 In addition to the landmark shopping mall San-A Naha Main Place that has a supermarket, specialized stores and a movie theater, Ryubo Rakuichi that a Uniqlo store, MUJI store, Best Denki are located, and a huge appliance store Yamada Denki are available here. So, this shopping area is convenience for you to minimize total travel distance. Grand opening on April 25th 2015!! 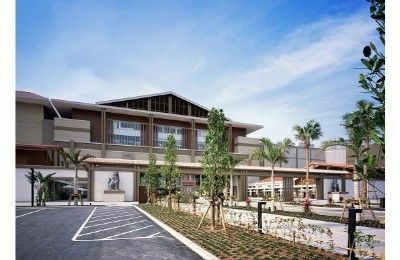 Full-scale resort mall that brings the Okinawa experience only to be tasted here. The bridge between Asia and the world, a new story that beings in Okinawa. A new generation resort mall, surrounded by the blue sky and sea, has been born in the land of RyCom. Food, culture, and tradition. In the gradual flow of time… A place to feel the old and the new Okinawa. A place to encounter locally originated glamour and Okinawa based trends. A place where the warmth of Okinawan people will comfort all visitors. The resort structure, combining the livelihood of people and the impressive experience of Okinawa, which has never existed, is right here. People who live in their hometown, people who travel, tourists from overseas. Each person forgets time, forgets the norm, and enjoys the present. This is the new and exciting livelihood and traveling that we will want to create with you. Now, from RyCom. Make this island even more fun.